It's Show Time - The Goomeri Show That Is! South Burnett locals are counting down the hours until the Goomeri Show. It all kicks off tomorrow, from 2pm and it promises to be one of the biggest the region has seen with some new sponsors coming on board this year. 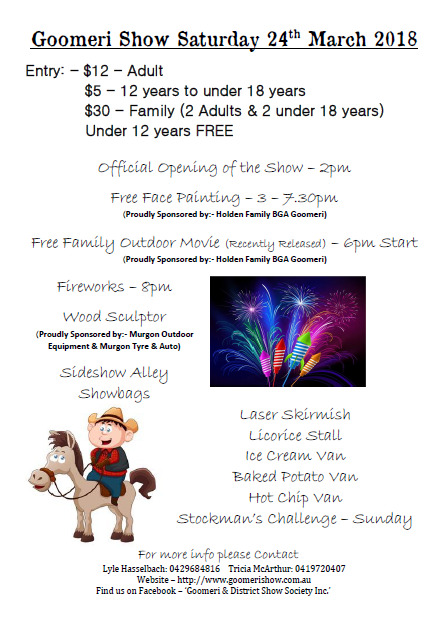 All things fun at the Goomeri Show - even an outdoor movie will be on offer for locals along with face painting for the kids, rides and showbags, plus fireworks to end the night with a bang! Adults can get in from just $12, and kids under 12 are free.